Today we will discuss another common case, how to create a progress bar to notify our web users about the state of their long running tasks. For this discussion we will work with DevExpress XAF Business Application Framework. We will develop ONE SMALL CLASS, we can then copy paste to any XAF project. It is a good idea before starting any work to search the Support Center for ideas and ask the DevExpress support guys. Doing so we found many tickets with ready to work solutions. Some of them are good candidates e.g How to start a long running operation in ASP.NET application using the ThreadPool.QueueUserWorkItem method and show its progress in a browser using a WebService method. The problem with the previous sample , is that uses a WebService to periodically call back in a Controller. I wanted to create a reusable implementation inside a library and a WebService cannot live in a library. First we need a sample project so let’s use the XAF New Solution Wizard to create a new Web Project. We do not need any extra modules or security, just create it as simple as possible. After the solution is created add a very simple Domain Object so XAF can generate a web View for it. In addition we need create a sequence of Tasks that will return the state of our work. You can use any technology you prefer e.g. webservices, TPL tasksetc. as long as it returns asynchronously it fits our case. For this discussion I will use the System.Reactive library. To create the sequence the next line will be enough. If you want to test how it behaves add it in a console app and you should see the following output. In XAF we use Controllers to communicate with our Views so let’s create a very simple Controller and add our sequence and later connect the progress bar. This controller declares an StartLongOperation Action and starts our sequence, exactly as described on XAF docs. Currently XAF already generated the web UI and actions. Here how the DetailView of MyObject looks like. 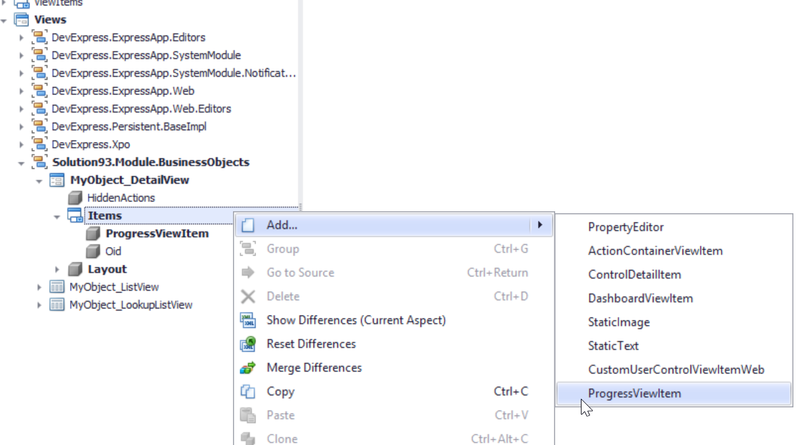 We override the CreateControlCore method and just return an ASPxProgressBar component included in DevExpress suite. Our scenario is very similar but we need to remove the dependency to the WebService because we need to push the implementation to our ExcelImporter module that is part of the eXpandFramework and is very hard to host a WebService in a library so it can be reusable and with friction-less installation. In short the Start method use the build-in XAF CallBackManager to generate a script with one parameter the ProgressBar.ClientInstance name. We pass this parameter because we may want to use multiple progress-bars in the same view. Next the timer calls this script every PollingInterval. Whats left is to implement the IXafCallbackHandler as shown. Here we just created a script that uses the client side ASPxProgressBar API to SetPosition based on the new ProgressViewItem Position property. Finally let's add our ProgressViewItem to the a View. We will use the Model editor to create it and drag & drop to the Layout. 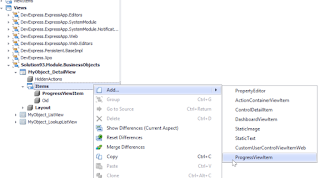 Below you can see how the ProgressViewItem works in runtime in our sample solution. I wrote this post as a proof of concept rather than a complete implementation, so I am not posting any samples. However you can download the the complete ProgressViewItem used if you wish from this gist. Below you can verify that it works fine in a real world complex module like the ExcelImporter. XAF can do Mobile and Windows as well, a Mobile implementation for this scenario does not make much sense but have a look how it looks in the Windows platform.